It is difficult to be sure whether the article that I found on this proposal is wholly serious, given the concept is for a 220 mile completed segregated private toll road from Calais to Coburn Gore in Maine, with the primary traffic being trucks, yet with the key money expected to be made from providing a corridor for utilities - in particular energy pipelines. “A completely fenced-in, 220-mile private toll road, running along rivers, lakes and farms, then over mountains and ridgelines. 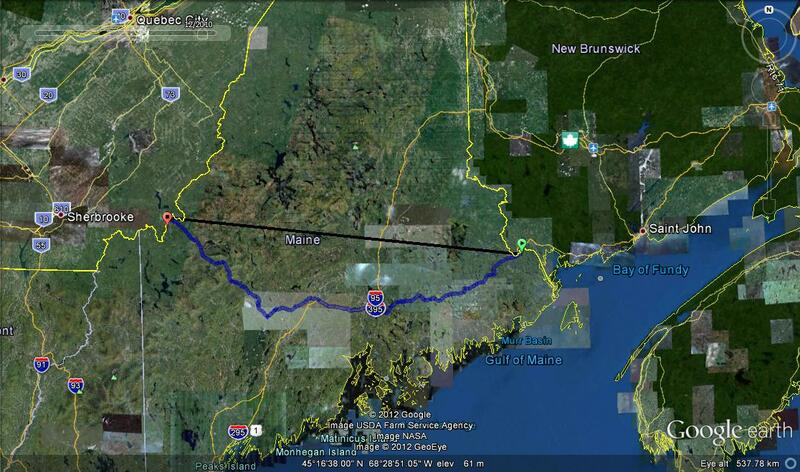 Starting in Calais and ending at the Quebec border at Coburn Gore, the so-called "east-west corridor" is being pushed by Peter Vigue, head of Cianbro, the construction wing of Maine's energy-speculation industrial complex. Under Vigue's plan, a steady parade of tired Canadian truckers hauling tandem trailers (or Irving tanker trucks filled with gas and diesel) from the Port of Saint John in New Brunswick will pay $125 to save two hours driving time en route to Quebec. The tolls from the truckers coming from both directions, though, won't be enough to pay for the construction of the $2 billion road project. And since Vigue won't even venture a guess on the fee for passenger vehicles, it's doubtful revenue from tourist traffic will make a dent in the construction debt. That's why the scheme is referred to as a "corridor" instead of a "highway." protestations to the contrary, Vigue's fancy new website (eastwestme.com) admits the powerful truth: the road paves the future for utility and communications corporations to run lines from Canada into the heart of Maine. Big Wind and other energy giants will be glad to rent the private highway's median as a way to link to the power grid. And once the roadwork is completed, then voilà, a ready-made path exists for a pipeline pumping oil sands to the Canadian Maritimes. This all seems a bit of a gamble of course, the issue being whether electricity utilities and telcos actually want such a corridor, which isn't clear. The oil sands point may be more of a point, but what's most important is seeing a road corridor as being much more than a place for vehicles to drive along, but actually a utility corridor. Such corridors are getting precious in urban areas in particular, as it is expensive and laborious seeking approval from last numbers of property owners. Despite support from Governor LePage and members of the Legislature, the highway isn't a done deal, yet. Vigue still has to raise billions of bucks, followed by the tough task of convincing regulators that paving a new roadway through undeveloped land — and expanding existing logging roads — won't hurt the environment. Even if he makes it past the bureaucrats, he'll have to contend with court challenges and other actions by environmentalists. And by then, it'll take more than Vigue's six bodyguards to quell the angry mobs. UPDATE: The Morning Sentinel says that Quebec authorities have heard nothing of the company Ciabro since 2008 about the proposal. Quebec Ministry of Transportation spokesman Mario St-Pierre said that although there has not been any contact for some time, the project is viewed positively by the province.